Tilex cleaning products from Clorox! The ugly truth is, 100% of homes have mold! And while most cleaners can remove visible dirt, the deep-cleaning Tilex lineup is formulated to attack mold and mildew before they blossom into stubborn stains. 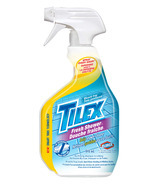 Make Tilex the foundation of your bathroom cleaning routine to keep mold out of sight. Your bathroom isn't clean until it's Tilex clean!